Xiaomi Mi Mix 3 is poised to be a part of the next wave of slider smartphones, right along with the Honor Magic 2 and the Lenovo Z5 Pro. Now a new leak adds a previously unknown detail about it – an AI-dedicated button on the side. The service will be called Xiao AI and will also arrive on the Xiaomi LEX, whatever that is. Having a dedicated key for the AI assistant is not a first – LG has one for the Google Assistant and Samsung does it for Bixby, while Google and HTC have squeeze gestures. Xiao AI (also seen as Xiaoai) came preloaded on the Mi Mix 2S and is widely available in China, but is yet to arrive outside of Xiaomis domestic market. 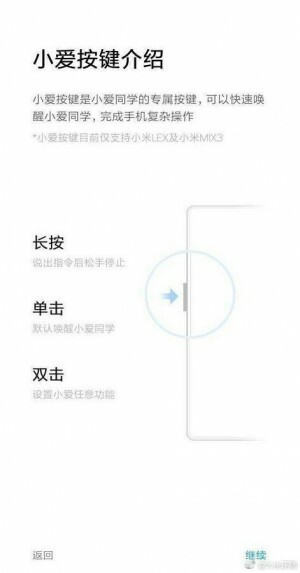 The service will be opened with one press of the dedicated button, but the new MIUI will allow you to remap the double press action of the key.